The first books for girls will be available at Lego from September. 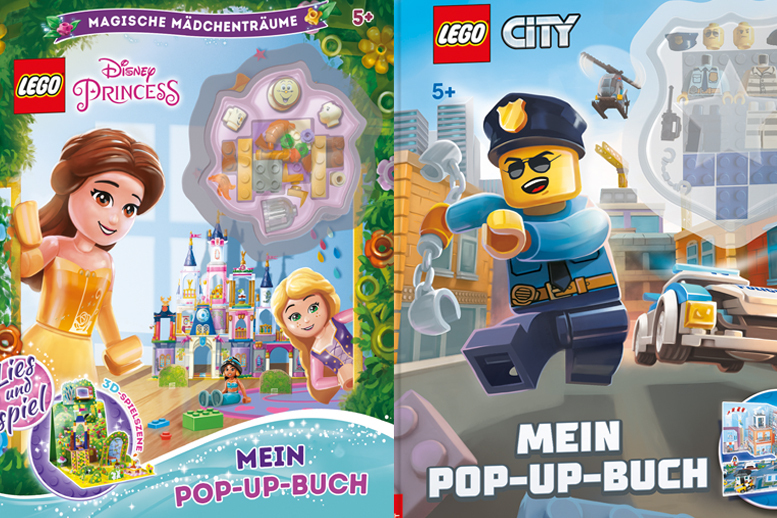 In the new play book format “My Pop-up Book”, children can recreate the fairy tale worlds with Rapunzel, Jasmin, Belle & Co with Lego Disney Princess. And there are further innovations in the brand’s portfolio. While the girls are all about “princesses”, for the boys the theme is”chaos in the Dino Park”. With a new sticker adventure by Lego Jurassic World it is the perfect complement to the second “Jurassic World” movie which will be released in June. The top title Ninjago also promises new conundrum and reading adventures with Poe in “All About Garmadon’s Biker Gang”. In spring, the portfolio was also expanded by the Schleich brand. Horse Club books were also developed for this purpose this year. Here stories about girl friendships and horse love are told so successfully that the series is now continued in a new diary format. Other books with new stories and minifigures from the coveted brands Lego Nexo Knights and Lego DC Comic Super Heroes are also represented. The pop-up book is also available in the Lego City theme world and is to appeal to the young target group with a city scenery for setting up and playing. Also available from fall: Youtube stars Bernd Bagger and Hector Helicopter for three- to five-year-olds. In the form of a reading book, two cardboard picture books and a friendship book, the digital world is offered here analogously in book form for home.